NATO confirmed it plans a storage facility for US military equipment in Poland, as the alliance steps up its defences in the face of increased Russian assertiveness. The Wall Street Journal reported that the $260 million facility will be located in Powidz, some 200 km (120 miles) west of Warsaw, and will house armoured vehicles, ammunition and weapons for a brigade. The move is in line with Washington's strategy for quickly deploying troops in Europe in case of a Russian incursion, the US newspaper reported. Building work will start in the summer and is expected to take two years, alliance chief Jens Stoltenberg told the Journal. Stoltenberg told the Journal the new facility would 'underpin the increased US presence in Poland'. Poland's government has been beefing up its military ties with the US, agreeing in February to buy American mobile rocket launchers worth $414 million and a year ago signing a $4.75 billion contract for a US-made Patriot anti-missile system. Maintaining close military and other ties with the US, going beyond NATO membership, is a key element of Poland's foreign and security policy. Amid fears of Russian aggression following Moscow's annexation of the Crimea region of Ukraine in 2014, NATO decided at a Warsaw summit in July 2016 to deploy four rotating multinational battalions to Poland and the Baltic states. Another long-running issue, and a reason for staying close to the US, is that of Poland's becoming part of the US Visa Waiver programme. The US ambassador to Warsaw, Georgette Mosbacher, in an interview with Polsat News on Thursday, said she was working to make Poland part of the US Visa Waiver Program by the time she leaves her post in Warsaw, if not by the end of this year. During a visit to Warsaw last month, US State Secretary Mike Pompeo said he hoped visa requirements for Poles traveling to the US would be revoked "soon." "There are a set of requirements that we have in place. Poland is getting closer and closer", Pompeo said. It is hard to see any Polish government pursuing a different policy. Unyielding the US may appear, especially on the visa issue, and however small the rewards to date for Poland's unceasing support of the US, including taking part in military operations in the Middle east, there is for Poland little realistic alternative, from a security point of view, of staying close to the US. 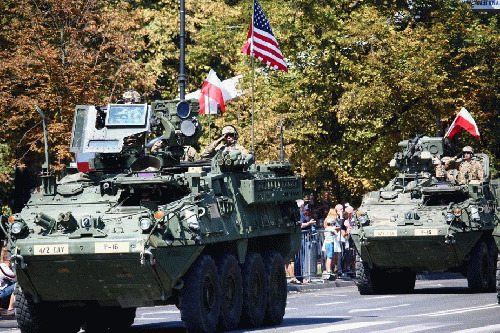 Not every member of NATO is as committed to meeting its obligations as Poland. Given its geography and history, this "NAT0 plus" approach seems sensible and realistic as, step by step, Poland seeks to achieve long-term security. Another US military base on Russia's borders.And Russia is the aggressor? ?